How Many Colors Can You See?- Red, yellow, green all the colors we will have seen! Why are animals all those different colors? Come find out! 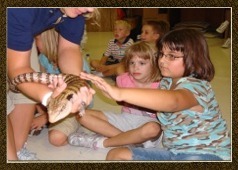 Animal Tales- With a storybook and a zoo animal, make reading a hands-on experience. Scales, Feathers and Fur- Whether it’s scales, feather or fur, join us to take a closer look at what animals are covered with. Everybody Needs a Home- Explore the world of animal habitats. Learn how different kinds of animals make different kinds of homes. Colors and Patterns- From red to brown, stripes to spots, learn the function of the many colors and patterns found in nature. 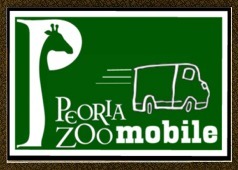 Who’s Who at the Zoo? From Start to Finish- From pupae to egg to pouch let’s explore life cycles in the animal world. 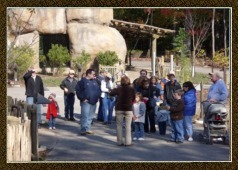 Dinner or Diner- Experience an eat or be eaten world as we look at the predator/prey relationship in the animal world. An Animal for All Seasons- Hot or cold, let’s look at how animals make it through the seasons without air conditioning or a hat and mittens. Counting Sheep- Which animal sleeps up to 20 hours a day? Who sleeps standing up? What do you call an animal that sleeps all day and comes out at night? Camouflage - Learn how animals use camouflage to survive. From colors to patterns, see how they blend in and hide for predation and protection. Spineless Wonders- Explore the wonderful world of invertebrates! Learn characteristics and behaviors of insects, spiders, and marine invertebrates. Amazing Animal Adaptations- Investigate the world of animals. Find out how each animal has special tools and behaviors that help it survive perfectly in its environment. Endangered Species- Take a closer look at these rare animals. Come explore some ways that we can help fix the problems in our environment. 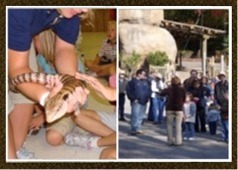 What Do You Zoo?- Examine the purposes of zoos and the many careers in the zoo field. Don’t see what you want? We can custom fit a program to fit any topic.